Allsky image of the total solar eclipse of August 21, 2017, as seen from the Oregon Star Party. Imaged with a Canon EOS 6D and 9mm Sigma full frame fisheye at f/3.5, 6400 ISO, 1/4 second. The Great American Eclipse was utterly beautiful – and quick! Here is a short report on the phonomena I observed while watching the event under almost perfect clear skies at the Oregon Star Party site in the Ochoco Mountains in central Oregon. I got the tip from Stephen James O’Meara, who has done this several times on previous eclipses, on the evening before the event: it can be possible to spot the corona even before the sun is totally eclipsed. And indeed: some 7 minutes before totality, I could clearly see the corona against the bright blue background, when the remaining solar crescent was blocked from view. For this I used the roof of a nearby trailer from one of the OSP attendees. It was puzzling how clear the observation was, which was immediately repeated by other observers. I would conclude that the conora could have been observed even earlier. As told in a previous post, I am very much in favor of observing a total solar eclipse visually in a telescope, as this will reveal sights that cannot be seen with the naked eye or binoculars. My observations on August 21 with the 60mm f/5.9 Takahashi fluorite apochromat at 28x confirmed this impressively. In the telescope, the moon had a distinctive dark blue color – so intense which I haven’t seen during other total eclipses. 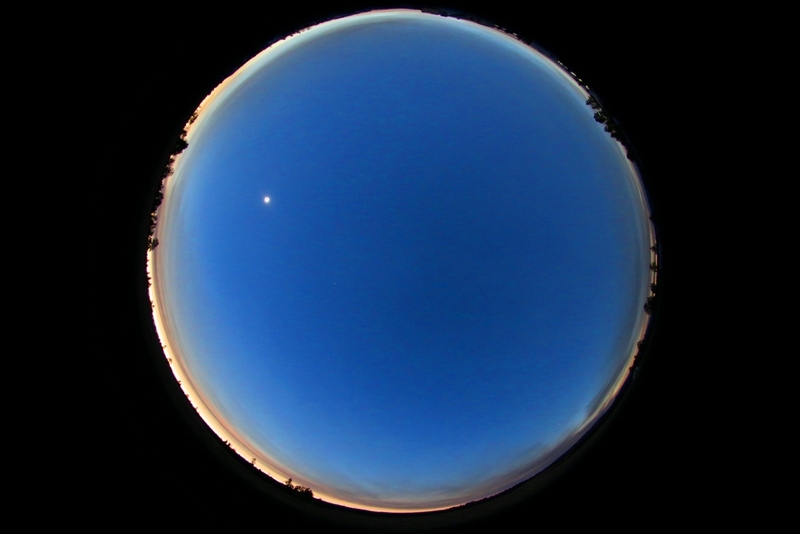 This blue color could come from the earth: earthshine, the reflection of sunlight from the earth to the moon, is strongest at new moon, ans shouldn’t be affected too much by the dimming of earthlight reaching the moon during the eclipse. On top of that, the lunar mare showed as black patches against the dark blue background! I knew that it should be possible to observe the lunar “seas” during an eclipse, but couldn’t actually see it for myself. The impression was not overly clear due to the contrast of the dark lunar disk to the bright corona surrounding it, but strong enough to be perceived without doubt. As told in my post before the eclipse, Baily’s beads, which occur at second and third contact, are among the most beautiful sights which can be seen in a telescope during an eclipse. On August 21, I managed to take off the filter at the right time, but was dissapointed that the beads only lasted for abount two seconds. Right before that, while taking off the filter, there was a pronounced diamond ring effect with the naked eye. At third contact, the beads were no different, and lasted only about two seconds. The image became too bright very quickly and I had to put the filter on the telescope very quickly. This is a very different observation compared to the 2015 eclipse which I followed from the Faroe Islands. Back then, Baily’s beads were extremely spectacular, and due to clouds present right after thrid contact, could be observed for a duration of about 15 seconds. I have never seen a more beautiful corona as on August 21! The clearly defined filamentary structure, outlined in large elongated “horns”, was extremely impressive! Unfortunately, the 90 seconds of darkness we got at the OSP site were too short for any detailed observations. I could not see any colour in the corona except for the silvery-white hue which contrasted so nicely with the dark blue of the moon and pink of the chromosphere. There were several prominences along the rim of the blackened sun. The most beautiful was near the spot where the sunlight came back on third contact. At every eclipse I am impressed by the pink colour of the chromosphere and the prominences, which is so different compared to the deep red image through an h-alpha filter. This is based in the fact that the prominences are not only emitting light in the h-alpha emission line, but also in other wavelenghts as h-beta (blue) and calcium-k (violet). Regulus added a beautiful beam of starlight to the view in the telescope and binoculars, hovering in the outer corona only 1 degree from the black sun. Other than that, I could only see Venus and Jupiter with the naked eye. 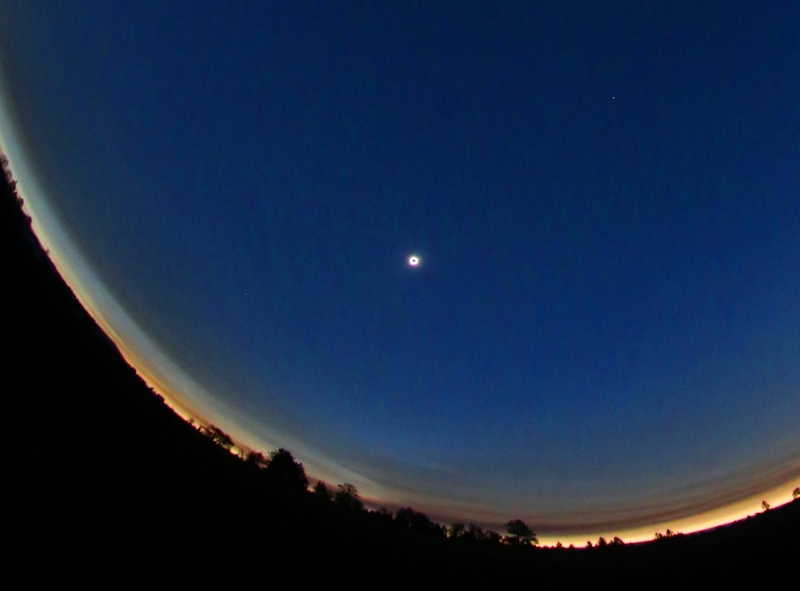 There was simply no time left to look for other stars and planets. The eclipsed sun with Venus (top right) and Jupiter (lower left) ob August 21, 2017, as seen from the Oregon Star Party. Imaged with a Canon EOS 6D and 9mm Sigma full frame fisheye at f/3.5, 6400 ISO, 1/10 second. I couldn’t see any shadow bands despite having a lot of suitable white and even surfaces around. At the dry climate of the Oregon outback, the temperature drop was very notable. I did not conduct actual measurements, but it was clearly felt that the temperature did recede. Overall, this was a very beautiful eclipse, but also the shortest I have experienced so far. Despite my own advice, I almost overextended myself by observing the event visually with the telescope, binoculars, and the naked eye, and taking photographs while doing that. For very short eclipses with a duration of only about 1 minute, I would recommend to leave out either binoculars or the telescope for not having to hurry as the eclipse progresses. thanks for this insightful article, and good to see that you were lucky weather-wise! Makes me really want to see another total eclipse, I’ll be planning for Chile 2019!